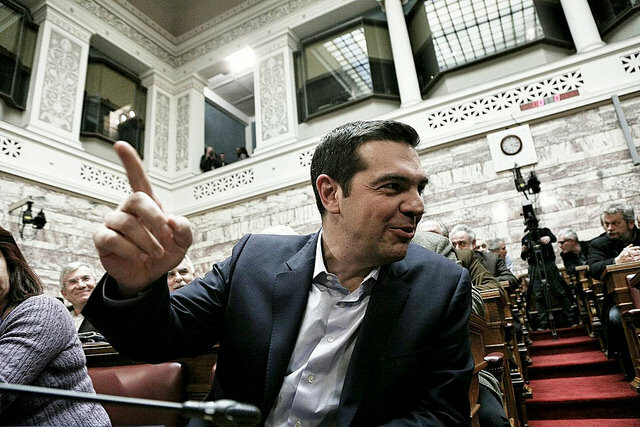 Syriza's deal with Greece's creditors hasn't bought more time or avoided austerity. It's demobilized Greek workers. In the last few days, there have been two sophisms circulating among those who refuse to look reality squarely in the face and recognize the retreat that Syriza has been forced to make, as well as its possible consequences. Or rather, two and a half. And I say “forced” with good reason, because the new government has been trapped by its mistaken strategy (though I wouldn’t say it was a “betrayal” or “capitulation,” since these are moralizing terms that are of very little use for understanding political processes). The first sophism: “Syriza has no mandate to quit the eurozone.” If it had adopted such a position, it wouldn’t have won the elections. Putting it that way, we see how absurd this reasoning is. Yes, of course it had no mandate to quit the eurozone. But it certainly didn’t have a mandate to abandon the core of its program in order to hang onto the euro, either! And, without doubt, if it had presented itself to the electorate saying, “here’s our program, but if we find that its implementation is incompatible with keeping the euro, then we’ll forget about it,” then it wouldn’t have achieved much success at the polls. For good reason: keeping the euro at any cost is exactly the same fundamental argument as the pro-memorandum parties who’ve ruled Greece all these years put forward. And even if Syriza never fully clarified its position on the euro, it did always reject the logic of “the euro at any price.” On that note, let’s remember that contrary to what most commentators think, Syriza’s programmatic texts do not rule out leaving the eurozone if forced to by the Europeans’ intransigence, or defaulting on the debt payments. Though it is true that recently these texts seem to have been rather hidden away. A second variant of this first sophism: Syriza had a dual mandate of breaking with austerity and staying in the euro. This sounds more rational than the first version, but nonetheless it is still sophistry. It’s as if the two sides of this mandate were equally important and thus it would be politically legitimate, if we had to choose (and indeed we do have to choose — that’s precisely the problem), to sacrifice the break with austerity on the altar of keeping the euro. Without having even abandoned its mandate! But then why not turn that reasoning around and say, “since I realize the two objectives are incompatible, I choose to stick to the break with austerity, since essentially that is the reason why Greeks voted for a party of the radical left?” That is, to opt for the rupture and not stability within the existing framework. We might at least think that this choice is more befitting of a radical left party that sets socialism as its strategic goal (even if that clearly wasn’t the agenda on which it won the elections). According to them, the main thing is that Syriza has bought time, admittedly at the cost of making some concessions (with the obligatory reference to Lenin to prove the radicalism of what they’re arguing); and that it has allowed for other future political victories (they mention Spain) and the development of social movement mobilizations of a “transnational” bent (the likes of Blockupy). Here again we are swimming in the waters of sophistry — of a pseudo-naivety that would be confusing if it did not make total sense coming from two ardent defenders of the European project (a “nice version” of it, of course). After all, the rhythms of the political forces to which they refer are not in synchrony. From now until summer, the Greek government faces a series of more than pressing deadlines; and it’s hard to see how a successful demonstration in Frankfurt, or even the possibility of Podemos winning the Spanish elections at the end of the year, could change the situation in Syriza’s favor. The gaps among these different forces’ temporal rhythms are one of the reasons why the national context is of such strategic importance to the actors in the political struggle: it is the terrain where the power relations among classes are condensed in decisive fashion. Balibar and Mezzadra also gravely underestimate the demobilizing effect that will inevitably follow — both within Greece and at the European level — from the perception that Greece and the Syriza government have been forced to kowtow to the EU’s austerity diktats. And this is what everyone is ultimately going to think, whatever the short-sighted defenders of the Greek government do to try and dress it up differently. Making any political choice conditional on the emergence of social movements is more than risky. It is a way of saying that it is a decision that will have to be changed if the mobilizations do not take place or if they are insufficiently powerful. In reality, we have to take the opposite line of march. We have to assume that we have already made the decision to break with austerity: it’s this that stimulates mobilization, which will then enjoy (or acquire) its own autonomy. Moreover, that is exactly what happened in Greece during the government’s “confrontation” with the European Union between February 5 and 20, when tens of thousands of people took to the street in a largely spontaneous manner, outside of any party framework. Besides, the argument that “we have won some time” is in this case an illusion, since during these four months of supposed respite, Syriza will in fact be forced to operate within the existing framework. And this will strengthen this framework: Syriza will have to implement a good part of what the troika (now restyled “the institutions”) demands, while putting off the application of the key measures of its own program — precisely the policies that would have allowed it to make a difference and cement the social alliance that brought it to power. Indeed there is a very major risk that the time that Syriza has “won” will prove to have been wasted time, undermining Syriza’s base while allowing its enemies (particularly those on the far right) to regroup and present themselves as the only partisans of a real systemic break. We should also note that, despite the disgust that Europeanism addicts like Balibar and Mezzadra feel at any mention of “the national,” the very political successes to which they refer, from Syriza to Podemos, not only took place within a national context — changing the relations of force precisely insofar as they allow radical left political movements to access the nation state’s levers of power — but were also, in part, only possible thanks to these parties’ insistence on national sovereignty: in a democratic, popular, non-nationalist sense, open to the outside world. National-popular discourse and references to patriotism abound — Tsipras and Iglesias are perfectly willing to use these terms — as do national flags (Greek and Spanish Republican ones, not to mention the flags of the nationalities within the Spanish State) among the crowds and the “autonomous” movements (as Mezzadra and Balibar call them) filling these countries’ streets and town squares. More than anything else, this shows that in the particular case of the dominated countries on the periphery of Europe like Spain and Greece, reference to the national is a terrain of struggle that progressive forces have managed to hegemonize, thus making it one of the most powerful factors driving their success. And this is the basis on which we can build a real internationalism, not the empty talk — entirely disconnected from the concrete realities of political struggle — about a supposedly already-existing and unmediated “European” or “transnational” terrain. One last point, to conclude: there is a degree of truth in the first two sophisms, when they talk about Syriza’s mandate to leave the Eurozone. It is indeed true that there has been a contradiction in the party’s dominant approach to this question, a contradiction that has now burst into full view. The idea of breaking with austerity and Greece’s debt burden within the existing European framework could not have been more clearly refuted in reality. In such a situation, it is vital that we speak frankly and honestly. The first thing to do is to admit the failure, and thus the need for us to discuss once again the best strategy for Syriza to keep its promises and get Greece out of its current rut. At the same time, this will send a message of struggle to all those people — and there are a lot of them — who were counting on the “hope offered by Greece” and rightly refuse to accept that they are beaten.